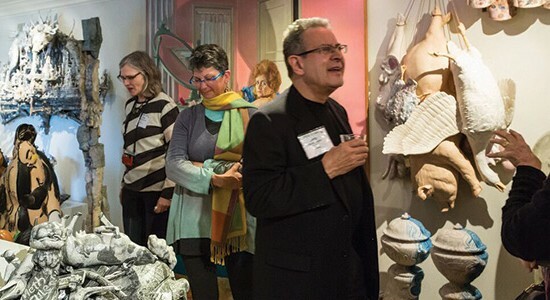 The 2019 NCECA Collectors Tour promises an exciting week of experiences designed for collectors of ceramic art. This experience promises a dynamic itinerary of exclusive studio and collection visits, curatorial and artistic connections, and insider opportunities to collect from the dozens of shows surrounding NCECA’s upcoming conference. The 2019 NCECA Collectors Tour will commence at noon on Monday, March 25 and conclude Saturday, March 30, 2019 following presentations by emerging artists and the conference closing lecture by influential artist Tony Marsh. This limited registration opportunity will extend to important studios, exhibitions, collections and organizations throughout the Twin Cities region as well as invitations to special experiences integrated within Claytopia, NCECA’s 53rd Annual Conference taking place at the Minneapolis Convention Center from March 26-30, 2019. The conference will include lectures, artist demonstrations and thought-provoking discussions on conditions that shape and influence ceramic art in history and the contemporary world. Registration will be limited due to the nature of experiences, which include insider access to leading art and artists, as well as special engagements with arts professionals, and private collections. Participants will gain early access to thoughtfully selected exhibitions and enjoy purchasing opportunities while sharing a few meals, conversations and interactions with prominent and emerging artists. NCECA will also be inviting special guests from the Twin Cities region’s cultural community and leading artists from NCECA’s membership to add texture, national and global perspective to the week. Travel throughout the region will be provided to most locations via luxury motor coach. Smaller vehicles may be used to reach special destinations.